Reid lists several suggestions throughout the book that would be helpful to someone assisting a person with cancer. These suggestions are precious and if used appropriately could help when taking care of the patient. While the book is disturbing from the fact of the sickness and difficulty, it is well written because it does share true life examples of what someone has gone through with this dread disease. It also shows the impact that cancer has on the family members and how they could benefit from reading this book should a family member of theirs be going through a similar situation. This book would be an excellent resource for the American Cancer Society, support groups, and local libraries to have a copy available to help others. Penned by Robert J. Reid, A Journey of Cancer, A Journey of Faith is a touching account of one family’s strength and fortitude against an ominous illness. In 1993, Mary Kristen Reid discovered a lump on her breast. This would mark the beginning of her grueling journey as she battled cancer. The journey would continue for sixteen years. All the way her husband and author of the book, Robert J. Reid, and their daughter, Sarah Reid, would stand with her, including friends and family. While describing the devastating impact of cancer on his wife and household, Reid also highlights the magical, happy moments in between the chaos. He describes how Mary’s faith grew along the way. For readers, he offers insight derived from his own experience as a caregiver to a cancer patient. A Journey of Cancer, A Journey of Faith is a saddening treatise, yet filled with incredible beauty and inspiration. The reasons why Robert J. Reid wrote the book are described from the beginning. The structure is set in a way to provide useful advice in an incredibly open manner that left me in admiration of the author’s frankness. Purposeful writing with well-relayed scenes and few technical details made for an effortless read. Mary Kristen Reid definitely tried her best to live a full life and did not let cancer ruin her hopes of a full life. All the way, Sarah and Robert’s love for her was clear and this created a sublime addition to the tragic process. Definitely a must-read for any caregiver, family or friend to a cancer patient. 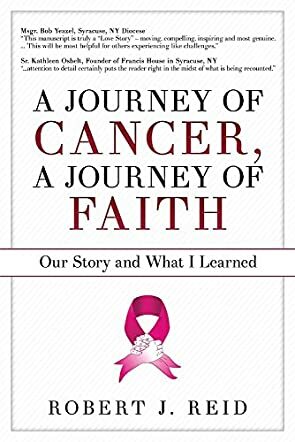 A Journey of Cancer, A Journey of Faith: Our Story and What I Learned by Robert J. Reid is the story of the author’s wife, Kris, who lived with breast cancer for over sixteen years. The story spans over 16 years and documents the inspirational journey of a family who learned to laugh and enjoy life through the ups and downs; Kris’ journey of faith from that of a lapsed Catholic to that of one with renewed faith, hope, and acceptance; and what the author learned during Kris’ ordeal. The intention of the book was to help the author with the grieving process and to help others with cancer, or care-givers dealing with cancer and cancer patients. This book will teach them about acceptance, patient support, the relationship between the patient and the doctor(s), hair loss due to chemo, having a physical and spiritual approach to cancer, and approaching God for help. A Journey of Cancer, A Journey of Faith: Our Story and What I Learned by Robert J. Reid is heartrending and moving. The author gives a detailed narration of the entire process, pulling in readers, and helping them to understand the emotional toll the family went through. I like the way the author combines the physical approach and spiritual approach on how to deal with cancer. The various stages of grieving - Shock, Denial, Anger, Bargaining, Depression, Testing, and Acceptance - have been discussed in depth so that readers know what to expect when it comes to their own feelings and emotions during the process. The statistics certainly aren’t reassuring. It would appear that everyone either knows someone with cancer, loves someone with cancer, or has cancer themselves. Some people with cancer respond well to treatment and return to a relatively normal life. Sadly, that is not always the case. Kris Reid’s battle with breast cancer was a long affair. She would recover, only to relapse when the cancer returned in the other breast or elsewhere in her body. When the cancer was found in her bones and then in her brain, hope dwindled. Ever a cheerful, strong person, Kris valiantly fought the battle with cancer right to the end. Her family, her loving husband and daughter, were there every step of the way. Any disease, but particularly cancer, is a journey, one of healing, hope and spiritual awakening and self discovery. For husband Robert J. Reid, and their daughter, Sarah, Kris’ cancer was also a difficult journey, one full of learning, not just technical medical jargon, but also learning more deeply about each other, and learning to lean on each other for support, love and care. After Kris’ death, Robert took his wife’s journals and his own memories and put together a memoir of sorts, one that tells his family’s story about cancer, one that he hopes might help others who have to endure similar journeys. A Journey of Cancer, A Journey of Faith: Our Story and What I Learned is a compassionate and thorough recounting of not just his wife’s battle with cancer, but his family’s battle as well. The narrative is injected with thoughts of faith and wisdom, things the author learned along the course of this journey, insightful intel that he realized later might assist those making the journey now. The story is told with love, hope and, of course, the painful fear of the unknown that we all face when cancer affects us or those we love. I applaud the author for his courage in sharing his story, sharing his wife’s story. Losing someone you love is painful enough. Writing about it can be heart-wrenching. But it can also be therapeutic. Thank you for sharing.